Here is an easy Christmas craft to set up with your little ones some time this holiday season. 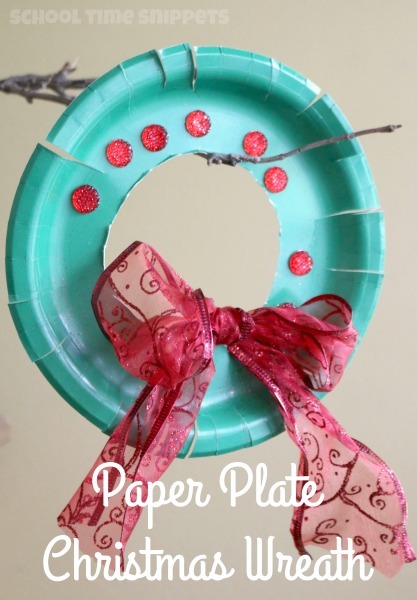 With a few simple materials, your child will make a Paper Plate Wreath Craft. It's a great way to sneak in fine motor skills practice! A much loved fine motor activity among preschoolers is the use of scissors. I try to make scissors and paper readily available for my littles because fine motor skills are so.very.important-- especially in this crazy technology age that we are in. Many more kids know how to "swipe" more than properly use scissors! Practice proper scissor use with this simple Christmas themed cutting activity. 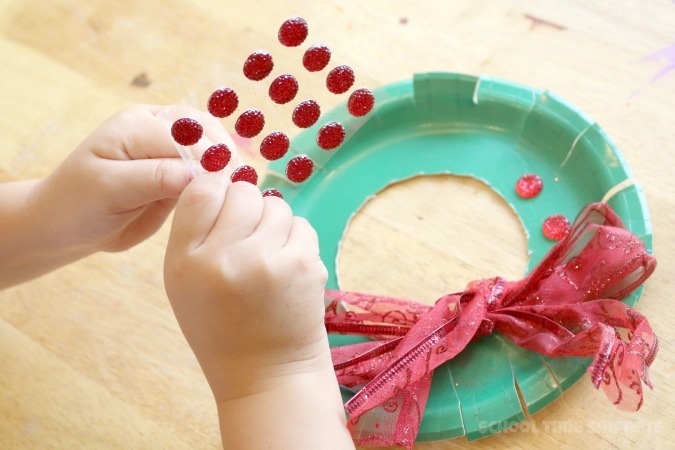 Your preschooler will love creating a Christmas wreath in the process. 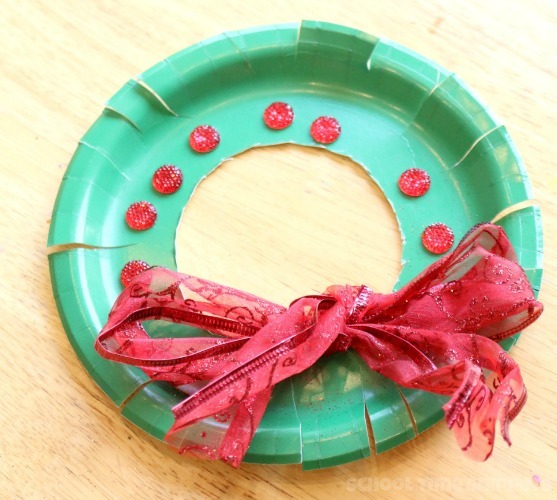 Prep the activity by cutting a circle out of the center of the green paper plate so that it resembles a wreath. ** Alternatively, you could use a white paper plate and have your child color it green with markers, paint, do-a dot markers, bleeding tissue paper, etc! 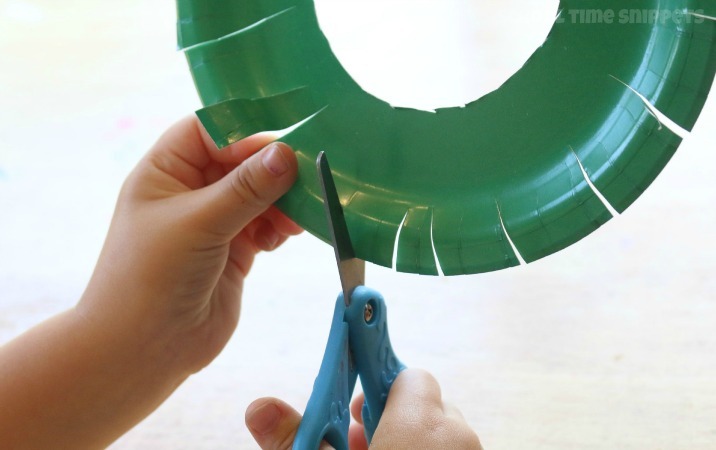 Encourage your child to use the scissors to make small snips around that paper plate. Make sure they do not cut all the way to the circle! Tie the red ribbon into a bow and glue it onto the wreath. Now your preschooler has made an easy and adorable Paper Plate Wreath Craft. Hand it somewhere around the house to show off this simple kid-made holiday decoration! It was such a simple way to work on fine motor skills! Snowman Scissor Skills Craft -- Another great way to practice cutting skills this winter season! What is Hiding in the Grass? Cutting Activity -- Save this idea for spring or summer time. It's a cute activity go-along for the book, In the Tall Tall Grass. Paper Plate Lion's Mane Craft -- If you end up buying white paper plates for this craft, save some to make these fun Paper Plate Lion's! Gingerbread Man Preschool Cutting Practice -- A fun extension activity for any Gingerbread themed book! Looking for more fine motor skills activities in one place? Check out our book!